Last summer (when the weather was warm!) FSL Surveyor Gareth Carr and MD Andy Roberts took up the Zip Wire challenge in aid of The Linda McCartney Centre and Breast Cancer. 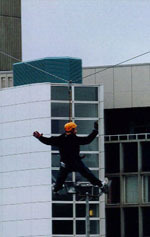 The zip wire was 230ft high and over 1000ft long, running from the roof of the Royal Liverpool University Hospital. Together they raised over £1000 and would like to thank everyone for their generosity and support.